Our full house tour shares all of the projects we’ve accomplished during our first year in our home and what we still have left on the to-do list! 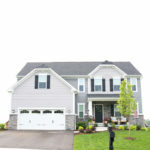 Update: See our 2.5 year progress in our Ryan Homes Palermo! In just a few days we will hit the one year mark of living in our house. For years, we hoped to find the home that would be our “forever home.” But always, for one reason or another, doors seemed to close, and we stayed in our little townhouse for more than seven years. Don’t get me wrong– I am SO thankful for the townhouse and for our time there. It’s the first house Connor remembers and the house that we brought Caleb home to. I started the blog in that house. We renovated and redecorated almost every single inch and really made it our own. And then last year all of the pieces fell into place, and before we knew it we were leaving the townhouse behind. 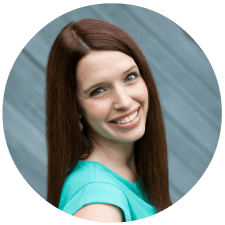 The Lord’s timing is truly perfect and as we look back, we can see how He orchestrated all of our circumstances in the way only He can, and for that we are so grateful. 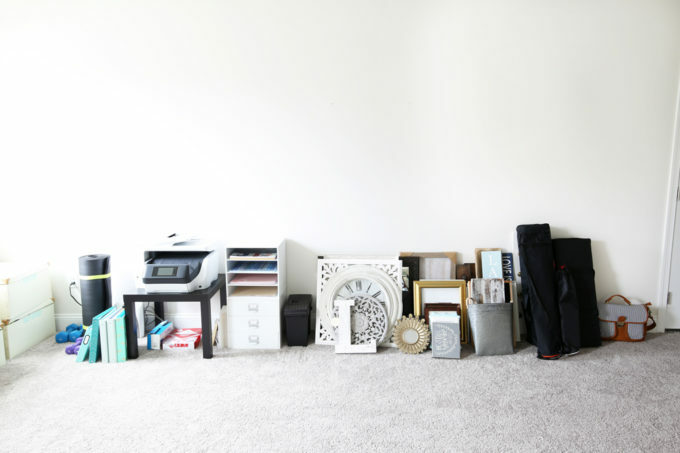 Moving was bittersweet– we certainly still think of the townhouse fondly but were also excited for new adventures, and that’s exactly what the past year has brought. If I’m being totally honest, moving and setting up a new house was more overwhelming than I expected it to be. (Perhaps because I was in my 30s this time around rather than my energy-filled early 20s? 😉 ) We certainly haven’t finished everything on our “to do list” for the house. From here you get to choose your own adventure! 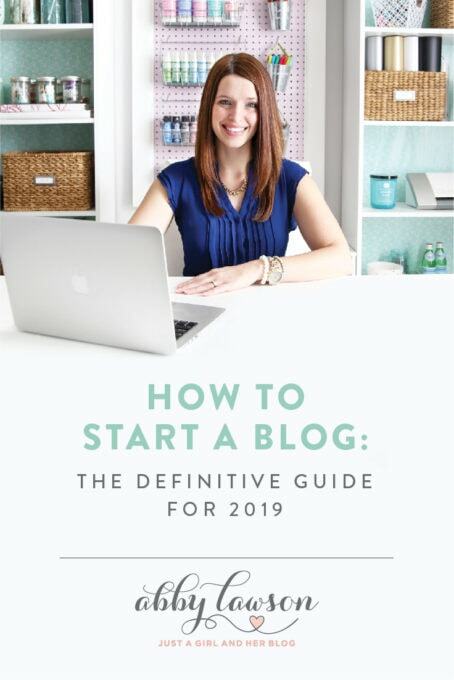 🙂 You can watch the video below and hear me talk through each space, or you can read and see the pictures after that. (Or do a little bit of both!) Either way, come on in! So this is our house! 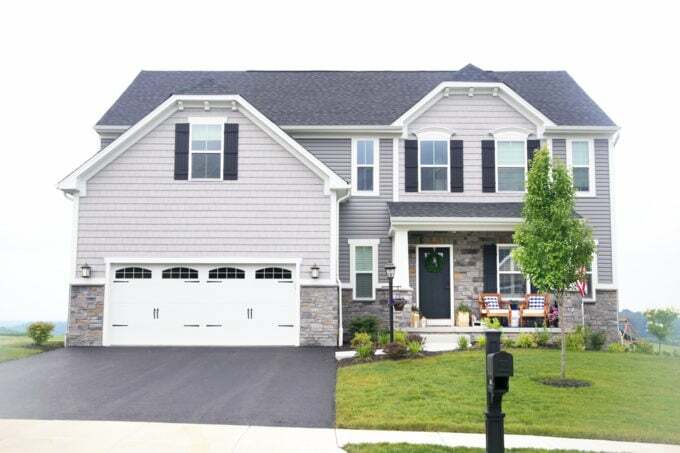 It is a Palermo model by Ryan Homes, and we chose a craftsman style elevation. Donnie and I have always loved that style, so when we saw that it was an option for our new home, we chose it immediately. Also if you’re familiar with my style at all, you know that I use a lot of gray and white, so the pewter siding with flint shake was an easy choice as well. As far as the front of the house goes, we haven’t made too many changes. We added the flag and brought in the chairs, garden stool, and rug. After that, it was just a matter of adding some cute planters and flowers, and the porch was ready for sittin’! Our entryway is pretty small, but I managed to find a little cabinet that was the perfect size to fit in the nook. 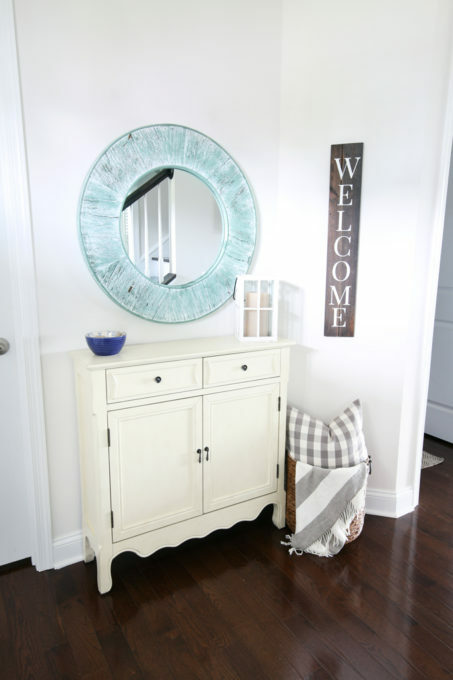 I also still really love the round aqua mirror, which I found on clearance at Hobby Lobby. 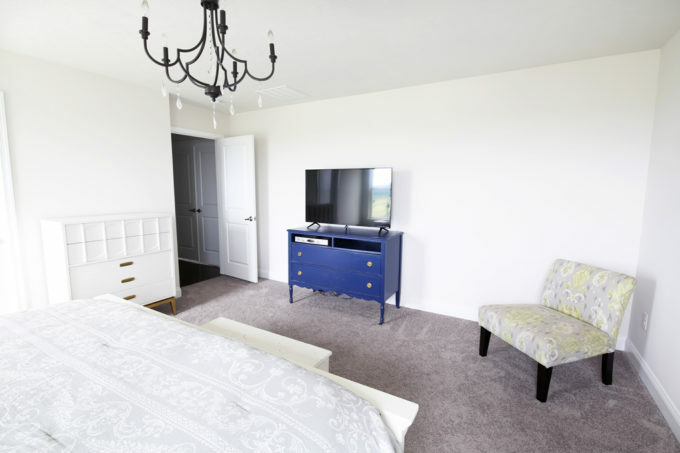 One thing you’ll notice pretty quickly is that most of our rooms are still white. That was the color that the builder painted them, and we’ve held off on doing much painting until we have an appointment in a few weeks where they’ll fix any nail pops or other imperfections in the drywall. After that is completed, you’d better bet I’m going to be painting like crazy all over the house! Across from the entry is our dining room– another room we’ll be painting in the not too distant future. 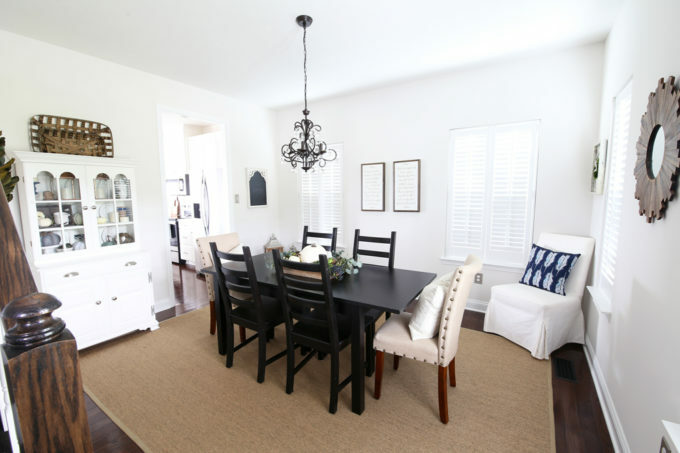 Since this room is in the front of the house, one of the first things we did was add beautiful plantation shutters for privacy purposes and just because they look so darn cute! We also added a pretty new light fixture, but other than that, all of the other pieces are items we used in our last house– the table and chairs, the rug, and my grandmother’s hutch. 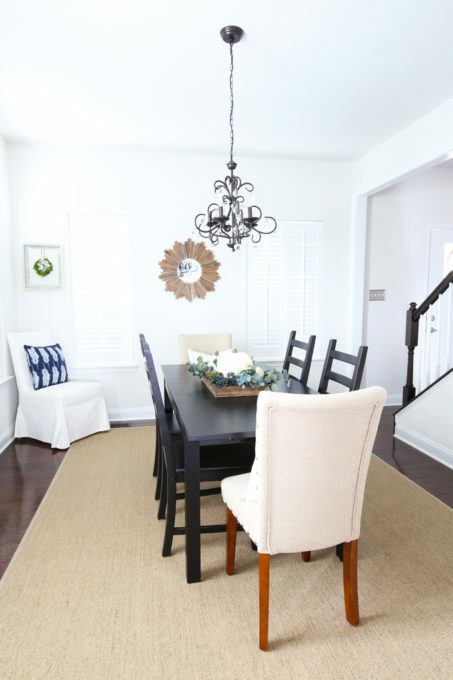 Update: See what our dining room looks like now in this post! Our kitchen is one of the spaces we’ve done the most work in since we’ve moved in. We switched out the laminate countertops for Caesarstone quartz in London Grey, which in itself made a huge difference. While we were replacing the counters, we added a deeper sink and a beautiful new faucet. We also installed pretty knobs and pulls to the cabinets and a marble tile backsplash. 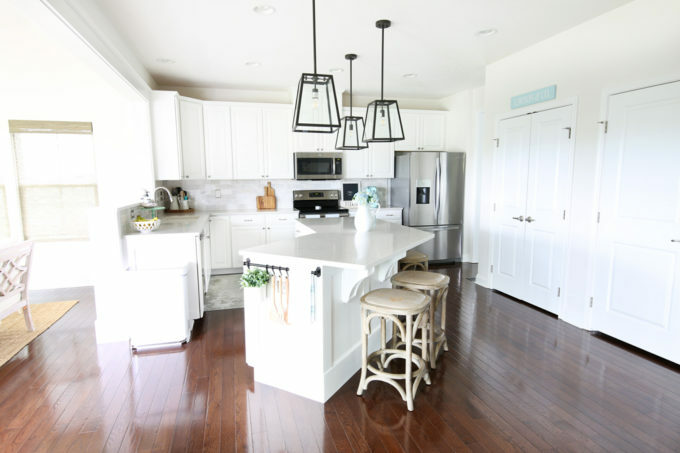 We brought in the pendants over the island and the counter stools from World Market (which, unfortunately, are no longer available). I get a lot of questions about the little bar and pot at the end of our island– they are part of the FINTORP series from IKEA! To add more character to the space, Donnie beefed up the trim on the island and added chunky corbels. He also trimmed out the opening between the kitchen and the sunroom to give it more interest. 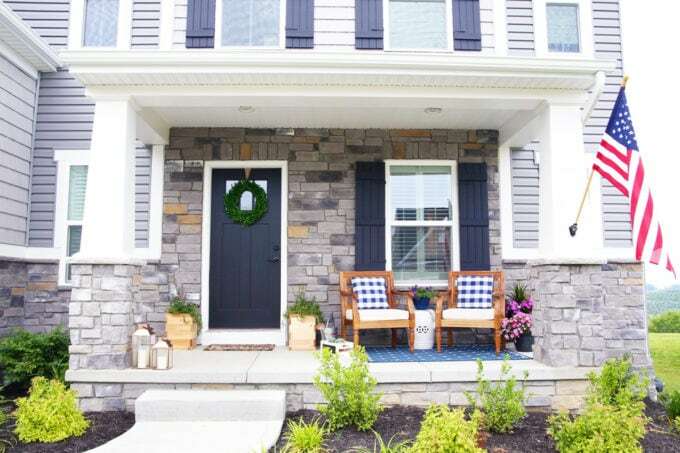 Eventually he will also replace the trim around the pantry and basement doors and the trim around the opening between the kitchen and dining room with something more substantial. We’ll paint in here as well! 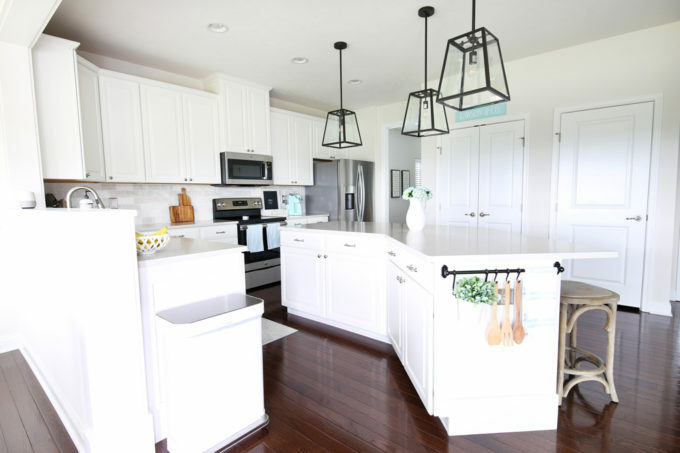 Update: See what our kitchen looks like now in this post! 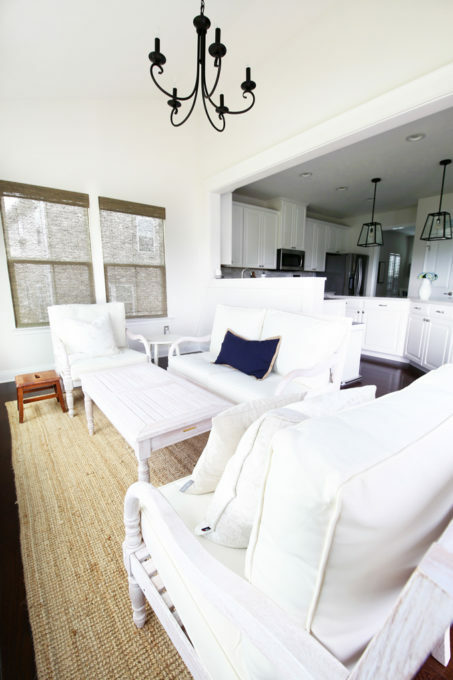 The sunroom is definitely one of my favorite rooms in the house (Okay, I have lots of favorite rooms in the house!) 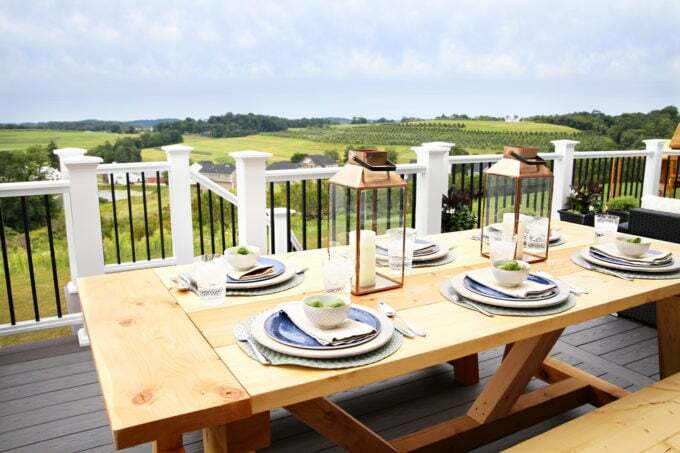 because it is the perfect place to sit with your drink of choice, relax, and enjoy the view of the beautiful orchard, farmland, and rolling hills that are right out those windows! Other than in my Instagram stories, I think this is the first peek I’ve shown of the new furniture we picked up for this space. When we built the deck, the furniture that used to be in this room headed outside, and I found these beautiful pieces from Ballard Designs to replace it. We went with the love seat, two chairs, and a coffee table, all from the Ceylon whitewash collection, and they ended up being the perfect fit for this space. I love that the pretty design on the back of the love seat is the first thing you see when you walk in from the kitchen. The pieces came with off white cushions, but I’m thinking of having them recovered to bring a little bit of color into the space. Along with the furniture, we also added a new light fixture, rug, and pretty bamboo shades (in Bali Abaca) to this space. We are still planning to paint in here, and I would LOVE to plank the vaulted ceiling for some added interest. 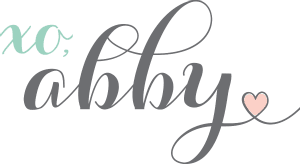 Update: See what our sunroom looks like now in this post! The deck is the newest addition to our house, and I think it’s safe to say that we’re obsessed! We love hanging out with friends, sharing meals around the table Donnie built, and just unwinding after a long day! Our house didn’t have a deck when we closed on it, so this was built just this summer. We went with AZEK decking in Island Oak for the main color and Dark Hickory for the trim. We may add a little patio area down below sometime in the future, and we’ve also thrown around the idea of putting a roof or pergola over part of the deck, but for now we are loving it exactly as it is. And that view! It is the #1 reason we chose our lot and definitely the reason I was so excited to get the deck finished up. We are certainly enjoying it! See our full deck reveal here! The living room was/is probably one of the most intimidating spaces to decorate in our home, mostly because it was just a big, blank white box! We used our IKEA EKTORP sofa and arm chair that we had in our last house and added the matching love seat to complete the set. The rug (my fav!!!) and light fixture were also new additions. I searched far and wide for a coffee table that could serve both the sofa and the love seat, and this square option ended up being the perfect choice. 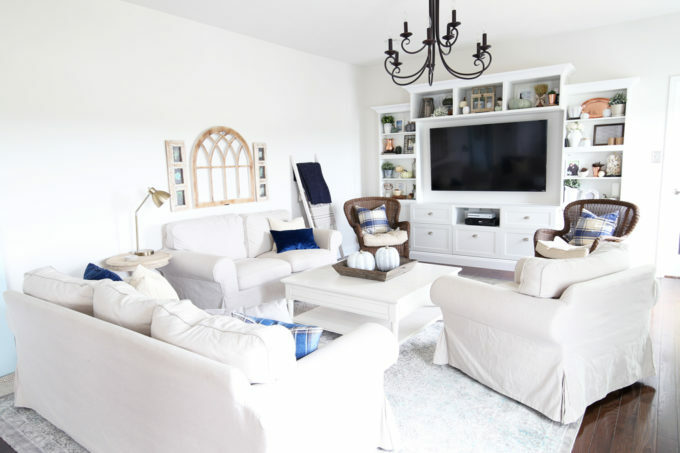 The chairs in front of the entertainment unit were originally for the front porch, but I loved them so much in here that I kept them and found something else for outside… oops! And speaking of the entertainment unit/built ins, Donnie created that with pieces from the IKEA BESTA system and then added custom trim work. 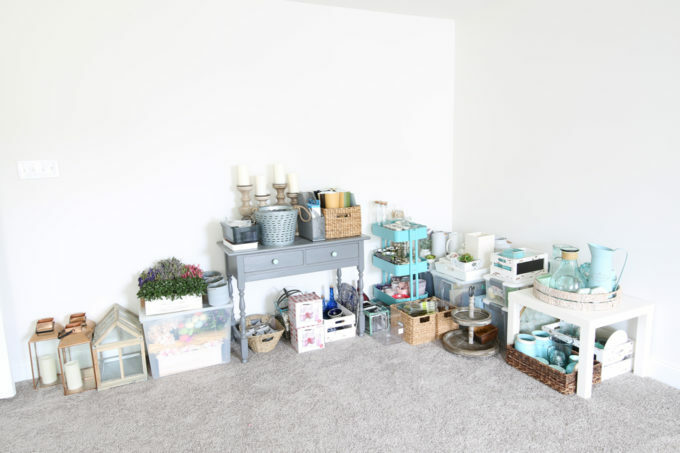 I love it because it gives me lots of pretty shelves that I can decorate each season and also offers tons of storage space for DVDs, video games, etc. I keep talking about adding window trim, and as you can see above, we managed to do just that in this space! I really love how much character it adds and am looking forward to the day when all of the windows are completed! 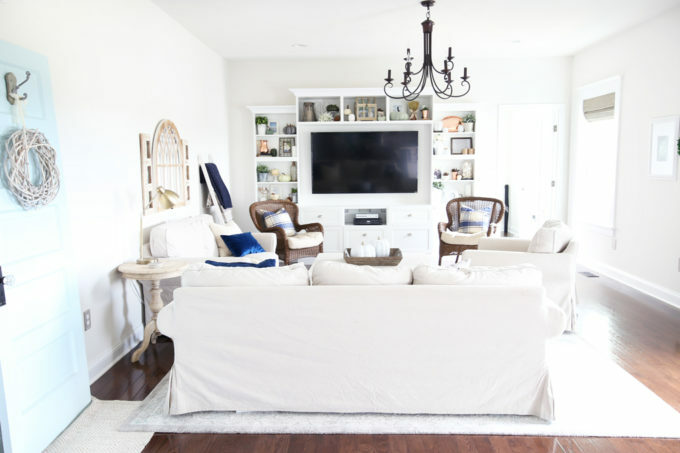 Update: See what our living room looks like now in this post! You’ll have to excuse the mess in this next room because it is the current project we’re working on! Donnie’s office is right off the living room, and though it is a small space, we have big plans for it! 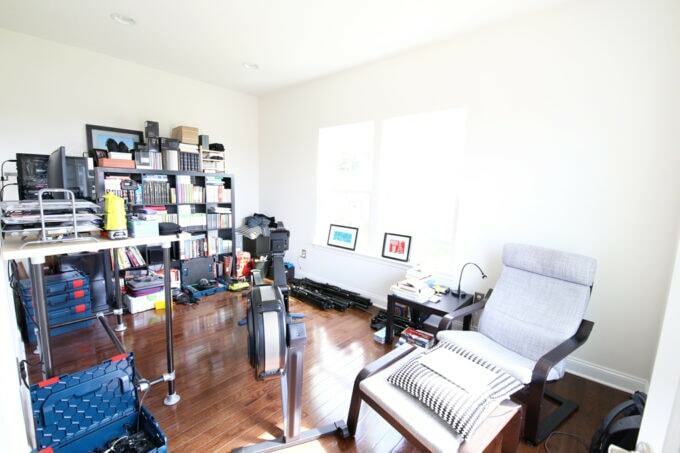 We are going to get rid of that big storage unit on the back wall and replace it with something that will be more functional for holding all of his books, video equipment, and everything else he wants to have easy access to. Update: See what Donnie’s office looks like now in this post! Whew! That about does it for the downstairs! Let’s head upstairs and visit a few more spaces! Though in general we’ve done considerably less upstairs than we have downstairs, our boys’ shared room is the first space we tackled when we moved in. We wanted them to feel like they were truly at home in our new house, and we loved putting together this cozy spot for them. 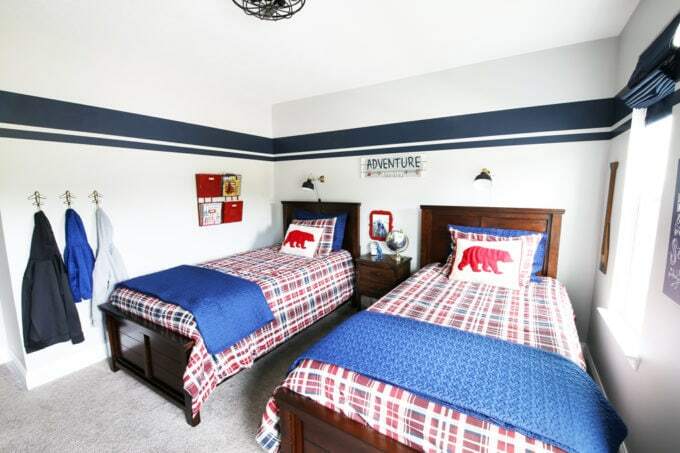 They basically only need to sleep and get dressed in this room since they have a playroom across the hall, so that gave us room to put in the “side by side” beds they requested rather than the bunk beds they had in our old house. We added blackout roman shades (because mama wants her boys to sleep soundly so she can also sleep soundly! 😉 and used a dresser that we already owned to hold all of their clothes. Both the overhead light and the lamps over their beds were new additions as well. The paint colors are Behr Marquee Silver City and Benjamin Moore Hale Navy. As far as future plans for this room go, we’re not planning on changing anything anytime soon! I suspect that someday the boys will want their own rooms again, and when that time comes, I’m sure we’ll end up reconfiguring some things, but for now, we’re leaving it as is! 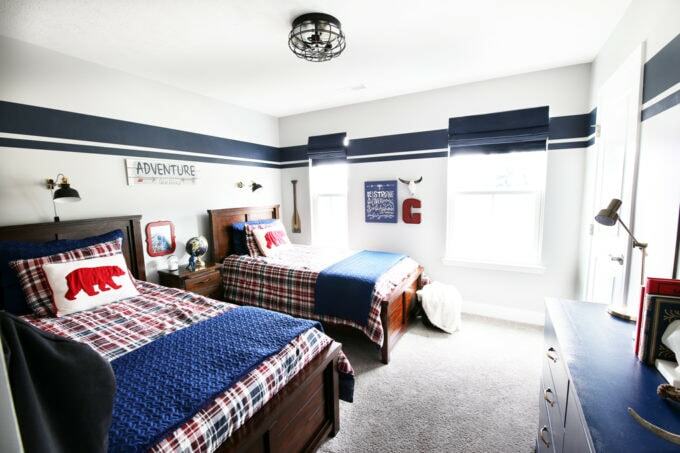 See the reveal of the boys’ room here! 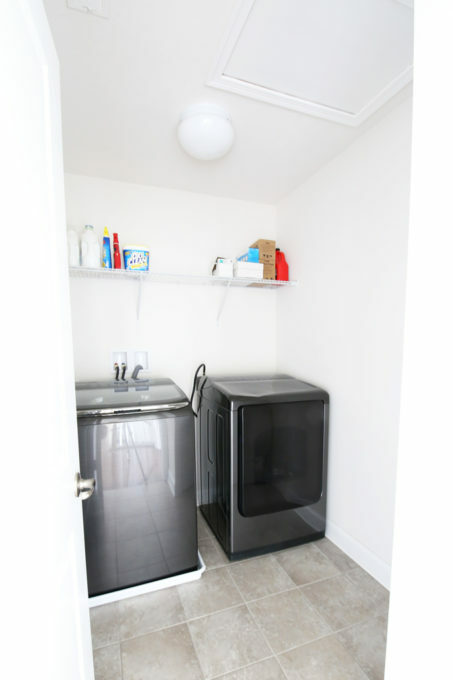 The laundry room is right next door to the boys’ room, and I love having it up on the second floor– it is so easy to throw in a load of laundry anytime! As you can see, we pretty much plopped down our washer and dryer and haven’t done anything else, but we plan to! I would love to rip out that wire shelf and replace it with some cabinets. We’ll definitely be painting, of course, and it would be fun to add a pretty backsplash in here too. I’m planning on replacing the light fixture with something a lot prettier as well. You are about to witness a miracle in the Lawson household because this playroom is never this clean! This is usually the room where I close the door and try to forget about it, but the boys tidied it up just for you! This is another room where we basically just set down a bunch of our existing furniture and let it be. The boys used to have a really cute little Lego table, but they outgrew it, so we have our old card table standing in temporarily. 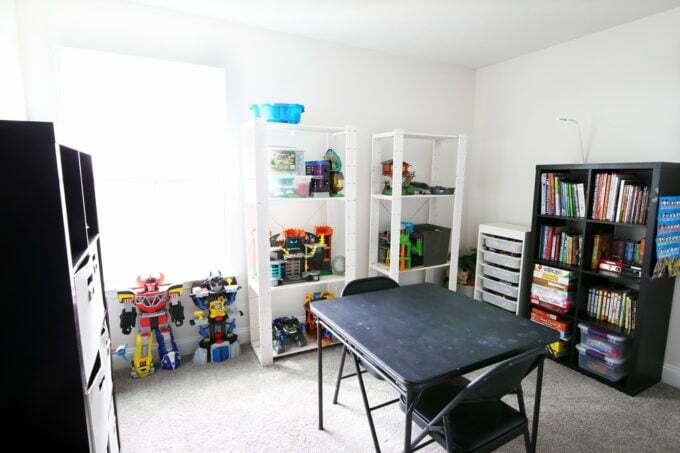 Every 3-6 months or so I try to do a big purge of all of the boys’ toys to keep this room as uncluttered as possible and we’re about due, so I’ll be sure to post about the purge and the changes we make when the time comes! 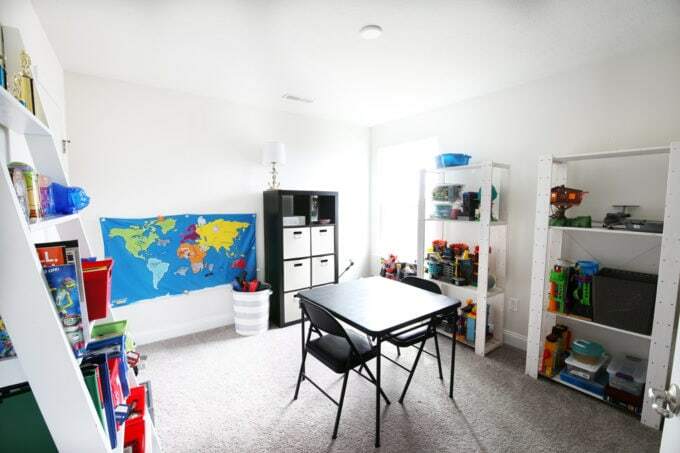 Update: See what our playroom looks like now in this post! We are thrilled to have a place for guests to stay in this house! My family lives a few hours away, so they were having to sleep on our couch in the townhouse when they came to visit. Now they have an actual bed… but not much else! 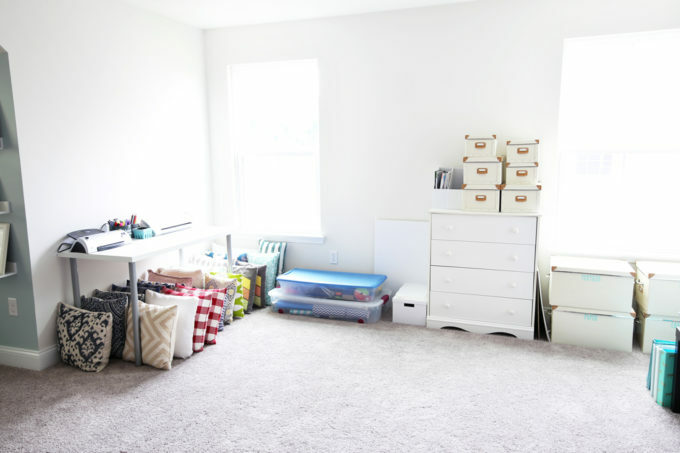 This is another room that’s on the to-do list! If you’ve been following my blog for a while, some of these pieces may look familiar. 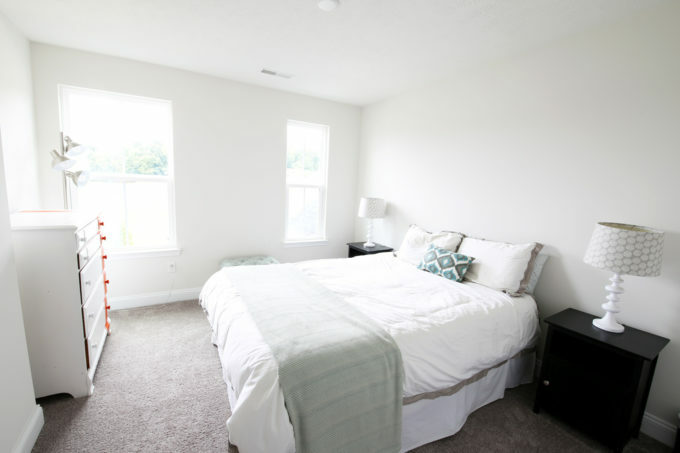 The bed, bedding, nightstands, and lamps are all from our master bedroom in the townhouse. The dresser was from the boys’ old room. So basically this room got the leftovers, but someday it will be a beautiful oasis for our guests to enjoy! Most of the storage pieces in my office in the townhouse were built in, so they all stayed with the house. 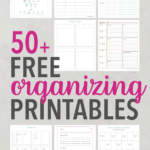 That means that I had next to zero storage for my current office– I just scrounged up whatever pieces we weren’t using in the rest of the house and did the best I could with them! Believe it or not, there is a method to my madness though. 😉 This corner holds all of the decor pieces that aren’t currently in use in the rest of the house. When it’s time to change out our decor for each season, this is where I come to “shop” our house. Eventually, this corner will have a bunch of cabinets so I can store everything more neatly and methodically. Along the next wall, I have camera equipment, followed by all of our extra wall decor that is waiting to be hung in various places in the house, followed by my printer. This wall will eventually have some shallow cabinets and hopefully some floating shelves for functional and beautiful storage. This corner is pillow central, as you can see! I also have my old desk which holds my Silhouette machine that I use to make all of my labels as well as my laminator. 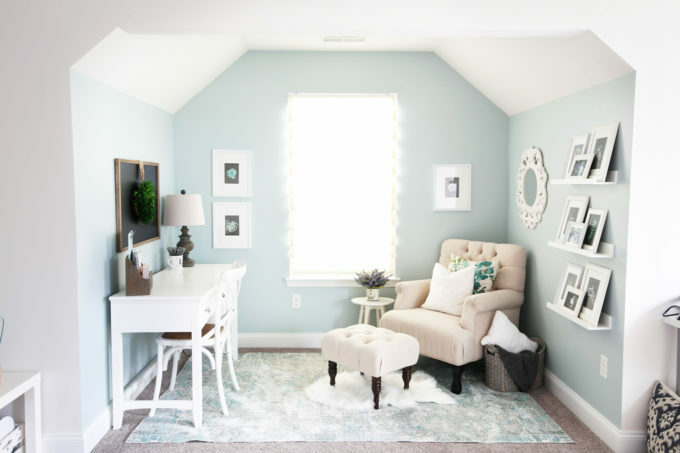 And finally… my nook! This is one of the only spots we’ve painted so far, and I’m in love with the color– Rainwashed by Sherwin Williams. I wanted to be able to sit at a desk (which, sadly, is no longer sold) and work or relax in a cozy chair + ottoman, so I was able to fit in both of those options. I added a roman shade to filter the light a bit while still keeping the room nice and bright and then hung some decor pieces as well. 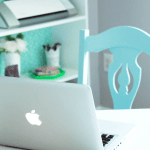 Update: See what my office looks like now in this post! Finally, we’ve come to our master bedroom! I feel like the master is often one of the last rooms to be decorated and this one is no exception. This room had no overhead light when we moved in, so that was a priority. And since we upgraded to a king mattress when we moved into this house, we did find a new bed and bedding we liked as well. We were without even nightstands for most of the first year, but when I had my surgery in March and spent a ton of time in this bed, I couldn’t take it anymore and ordered these cute side tables from the Magnolia Home collection. We obviously have a lot to do in here! I want to paint and add some sort of fun focal wall element to the wall behind the bed. And window treatments. Must have window treatments. I love the blue of Donnie’s dresser, but it doesn’t match the feel that I want for this space, so I think I may end up re-painting it. I want to replace the trunk at the end of the bed with a beautiful bench. That chair is just an extra one we had around, but I will eventually replace it and turn that whole corner into a cozy little reading nook. And, like so many of our rooms, we are in desperate need of things on the walls because it is looking pretty bare! Now most people move into a new house and start decorating. 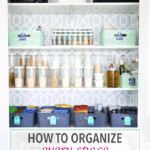 I move into a new house and start organizing! This closet was one of the very first projects we tackled when we moved in, and it has held up beautifully! We ripped out the wire shelving that was in here previously and replaced it with a custom closet system from EasyClosets. 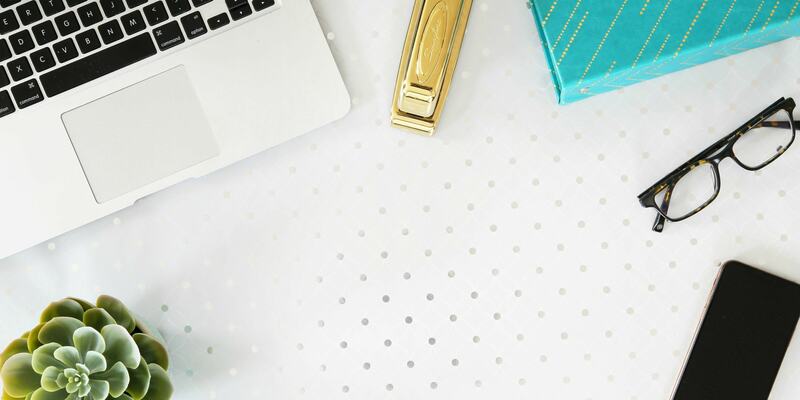 I love that everything has a spot, and it’s easy to keep things neat and tidy! Our closet is divided into two sections, so I have space for my items on one side, and Donnie’s clothes are on the other side. We also added pretty mini chandeliers in place of the boring dome lights that were in here before. 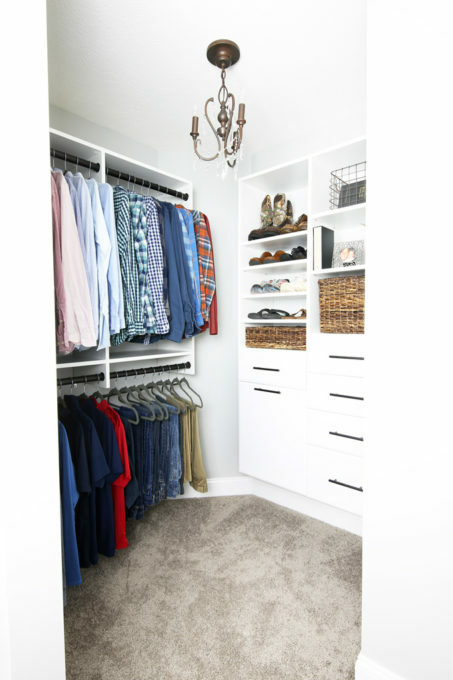 See our master closet reveal here! Well if you are still reading, I am super impressed because that turned out to be a BEAR of a post! Eeek! Even so, I hope this gave you a good idea of what we’ve been up to during the past year and where we’re headed in the year(s) ahead! We’ve done a lot, but we definitely still have a lot to do! If you have any ideas of what we should do with some of the rooms that are still unfinished, let me know in the comments! I am always up for suggestions! Thank you so much for joining me for the tour! Have a wonderful day! You both have done so much already! I fondly remember the 1 year walk through and promptly scheduling the painting, lol. 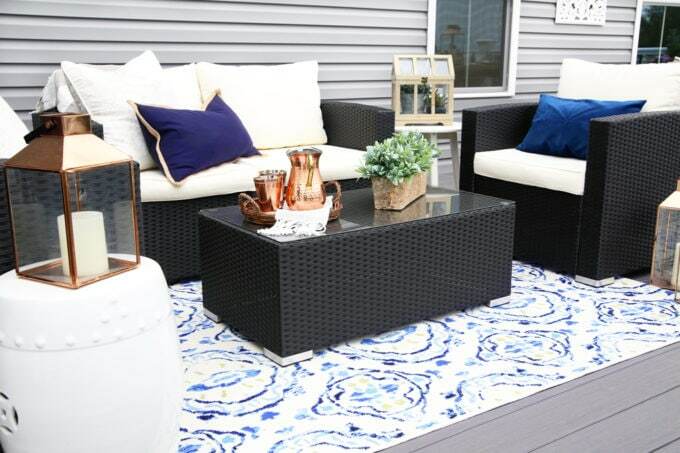 What color are you thinking of recovering the sun room cushions? The white is pretty, but a soft blue ticking stripe might look really nice, too. I look forward to the office & pillow stash updates! My jaw literally just dropped when I read your comment because we are totally on the same wavelength, girl! I was actually thinking of doing blue ticking for the cushions! I had actually originally picked out an IKEA love seat for the sunroom that had blue ticking stripes but it ended up being too big, so I thought I could bring in that look anyway with the cushions. You know what they say… great minds… 😉 Hope you are doing well, Brittany!! I can’t believe it’s already been a year, Abby! Everything looks beautiful. I am also really loving your YouTube channel! It’s so much fun seeing behind the scenes. Real life is always encouraging. 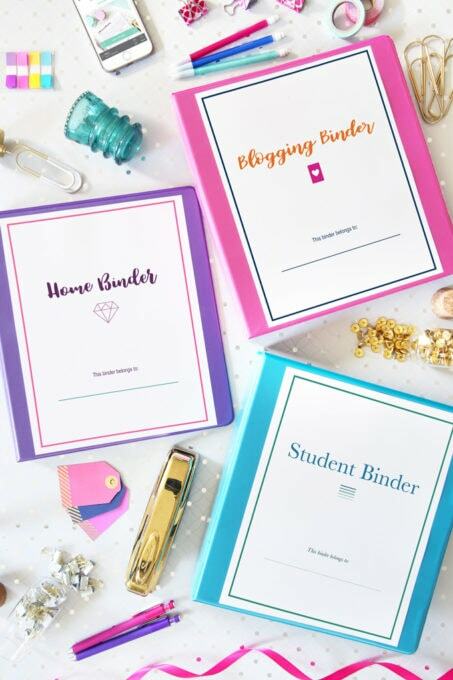 You’ve done SO much in just a year, and it looks like you have plenty more blog fodder to come for us to enjoy – yay! 😊 Your home is beautiful!! Lol! 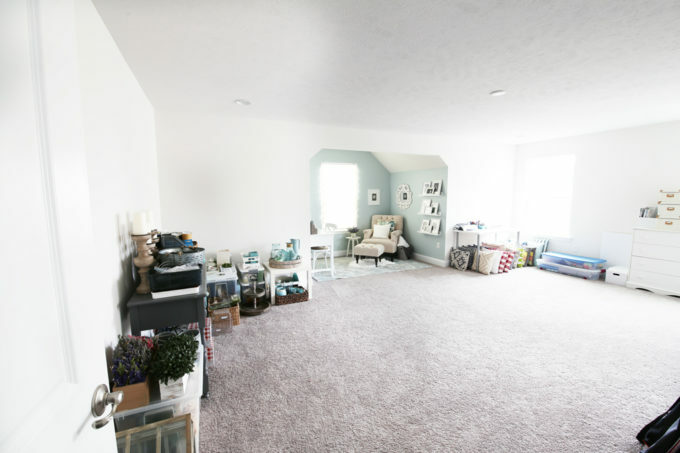 I know– I’m always saying “I feel like we’ve done so much… but we still have SO MUCH to go!” And I’m keeping pictures of the boys’ playroom to try to inspire them to clean it up more often, too. Haha. I hope you are doing well, friend!! Thank you so much for your kind words! Hey Abby! Ah, how has it already been a year in this house?! Updates like this remind me how long I’ve been keeping up with you guys. 🙂 Quick question – We are transitioning out of the military in the spring and are wanting to buy our forever home as well. We will both be 30 and have two young kids (4 and 2). We’ve really enjoyed fixing up our 1980s home (practically every inch! ), but we are T I R E D! So, we are leaning towards building or buying a new construction. Considering you moved from a place that you DIYed to a new build, do you feel much “free-er” not having to do house stuff all the time? I guess what I’m asking is are you glad you’re in a brand new home, or do you miss adding “charm” to something not quite as new? Hope this makes sense. 🙂 PS: I can’t wait to meet you at Enlighten new month! Wheeeee! I hear ya– that year totally flew by! And I totally relate to your “tired” feeling! After doing full kitchen and bath renovations in our townhouse (along with just about every other room in the house, lol), we weren’t really feeling up for completely gutting more spaces. Our new house felt like a good option because we don’t have to do any major renovations, but we’re doing a lot of the smaller “fun” stuff, like adding trim work, backsplash, etc. that will add character and just be pretty! We always still have a long list of projects, but everything is in good shape so it’s more about making the house our own on our own time rather than feeling like we have to fix everything. I hope that all makes sense, lol. SO EXCITED to meet you in less than a month!! See you soon! Abbey, your new home is just beautiful! It just looks so relaxing and I love the deck and the view!!! Thank you so much, Beth! You are so sweet! Hope you’re having a wonderful week! I’m absolutely in love with your whole house! One of my favorite rooms is the sun room. If I had a room like that in my house, I’d probably spend my quiet/prayer time there. I also love the kitchen! That backsplash ties everything together. Another thing I love is your lamp/chandelier choices! You have an incredible taste. Congrats on this beautiful home and I can’t wait to see your office and Donnie’s office after the new updates! You are the sweetest. Thanks so much, Isabel! The sun room really is so amazing! The perfect spot for my morning quiet time and hot chocolate (Yes, I’m five. I don’t drink coffee. LOL). Can’t wait to share the office with you all soon! 🙂 Hope you’re having a great weekend! Your home is so beautiful! I can’t wait to see what else you do to it. I’m looking most forward to seeing which paint colors you choose and your office when it if finished! Thanks so much, Crystal! I can’t wait to paint! 🙂 Looking forward to sharing with you all! Sitting here watching you walk through your lovely home, it’s just amazing. Thank you also for being real and honest about how it doesn’t always look that immaculate. As my mum keeps saying ‘a house is to be lived in’, I’m always trying to keep mine organised and tidy but sometimes it’s not as easy as it may look lol. 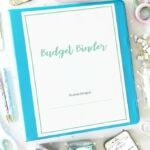 We’ve hit Spring here in Australia and I’m all into the spring cleaning and purging. Looking forward to more from you guys. Thanks Abby for sharing. Aw, thanks so much, Janine! With two boys around, our house is definitely not always perfect! It is very “lived in”. 🙂 Thank you for stopping by… so glad you’ll be following along! Have a great week! 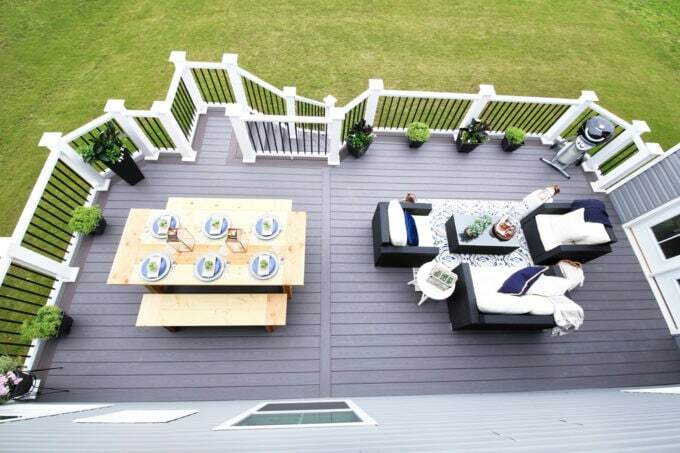 Oh I so love the deck! I can imagine sitting out there with a good book! Great job on that. You have such a beautiful house! And it makes me feel so much better about the unfinished parts of mine. There’s always more to do! Thank you so much for your sweet words, Hayley! And you are so right– there’s always something!!! 🙂 Hope you’re having a wonderful week! Your new home is so beautiful. I like your design style. Especially with the colors. You have done such an amazing job! 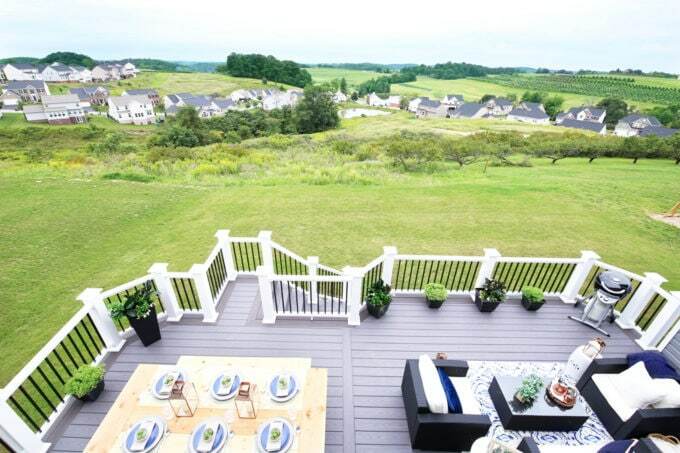 I still can’t get over the views you get from your deck, I can only imagine what it would feel like to enjoy a glass of wine overlooking the beautiful rolling houses and village houses. 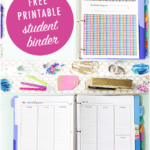 Looking forward to what else you come up with! Aw, thanks so much! We are loving it! 🙂 Hope you’re having a great week! I love your ideas! We have been in our Palermo for a year and haven’t accomplished nearly as much. I’m curious…did you change out the lights in the foyer yet? I do not like the ones that came with the house, but am struggling to find new ideas! I’d love to hear what you did, or what your thoughts are! Hi, Sarah! We did switch out the lights! 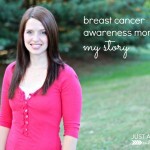 You can see what we did in this post: https://justagirlandherblog.com/light-swap/ ! 🙂 Have a great week! I’m writing this in my own sunroom. Having a sunroom or any cozy living space immediately off your kitchen is the best. A comfortable chair and ottoman, a good reading lamp, a small desk and a cat tree — who needs anything else? Well, two cats of course.